This 0000 is the best steel wool we have used. Made by Liberon, it is great for applying wax, cleaning and smoothing between coats of finish. It is produced from high quality steel to create a crumble and dust resistant wool. 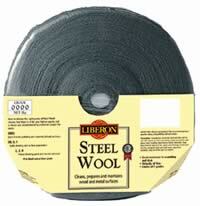 This steel wool is virtually oil free with long length strands. We offer it in a pack of 7 gram pads, a 250 gram Cardboard Sleeve or in a 1K (2.2 lb) Roll.